These are plastic encased (not encapsulated) 3- and 10-Watt flyback a-c to d-c switchers producing a dual output (±12V or ±15V). FCP are designed for the North American market. They operate from 115V a-c nominal. a-c input 85-132V; d-c input 110-170V Note: Safety approval for FCP applies to a-c operation only. 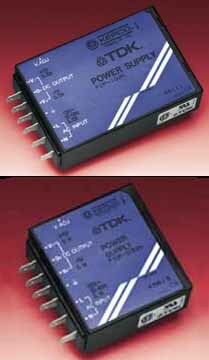 Principal (plus) output adjustable ±10%: Auxiliary (minus) tracks it with an accuracy of ±2% using a 3-terminal (linear) regulator. Rectangular current limiting on both outputs.